Today (February 27) is the feast of St. Gabriel Possenti, also know as St. Gabriel of Our Lady of Sorrows. I actually have a fun personal story about this particular saint. St. Gabriel Possenti was a Passionist, living in Abruzzo (the Italian region where my family is from) during the 19th century. He’s the patron of students, young people, and the Abruzzo region. My great-grandmother had a special devotion to him, as she grew up right next door to the church that housed his incorrupt body. I always heard growing up that my she and her family used to take care of this body, and that our family was blessed because of this. But still, this question bothered me for years until the advent of Google and just goes to show how truly ridiculous my mind is. A few years back, I started doing a little more research on this saint, and stumbled upon a link to a website about St. Gemma Galgani, who lived after Gabriel’s death, but had visions of him throughout her life. I was immediately taken with Gemma. Her diary is beautiful and has been a true help to me in the last few years. I really believe God sent Gemma to me right when I needed her, and used Gabriel to introduce us. This is what is really amazing about the communion of saints. As Catholics we believe that when we pass from this world, we are not dead, but alive in Christ. We are all part of His body. And just as we ask our friends on earth to pray for us, we have friends in heaven that will also give us their love and their prayers. We have a family that loves us, and nothing can separate us from each other, not even death. The story of St. Gabriel and his friendship with St. Gemma is a real testament to this. And in particular for me, it’s a reminder that saints aren’t always ancient people from distant, far-off lands. Yesterday, I was listening to a recording of a clinical psychologist who was speaking to an audience of Catholics dealing with infertility. His talk covered a number of struggles that he had seen in his patients, and one that stood out the most was this experience of an existential crisis. So often in Catholic circles (and society at large, for that matter), we try to tie our purpose in life to a specific, tangible mission. In the case of the married, this means raising children. Picture the dad in My Big Fat Greek Wedding: “Get Married! Make Babies!” This Mediterranean style of fatherly pontification was not at all foreign to me- my dad and his dad before him were both Italian. And while this simple, straightforward way of directing the young may have done well to keep our families in line for centuries, it glosses over one important truth: not everyone is called to domestic life, and not everyone who IS called to domesticity will have everything work out as they would wish. So what then, when the plan doesn’t play out? I’ve heard a few answers. I’ve heard of some who say that they found themselves called to adopt, or even to forgo adoption and consciously dedicate their lives to the Church. These are beautiful things, but they’re very specific. They work for these particular individuals, but they’re not always helpful for everyone facing these challenges. What is the purpose of our lives when they don’t fit the poster? The answer, I think, is very simple. And it’s our propensity to ignore or overlook the simple that leads us into so much distress as we continue to suffer through the searching. To know, love, and serve Him. It really is that simple. Your purpose, no matter who you are or what your state of life, is to know, love, and serve God. This is where we need to bring up a spiritual concept called “abandonment.” specifically this means giving up (abandoning) our own will and desires and trusting our Shepherd to lead us where He wishes. He knows the way home, and even though sometimes we think we know better, we don’t. We’re just little lambs. Furthermore, not only are we just little lambs, but we’re not God. We’re His servants. And as the servant, our job isn’t to say, “Ok God. I’m going to serve you my way by doing this thing I want.” No- He’s the boss. He’s the Master. He’s going to show us how He wants us to serve. This is why, even though some of our desires are good, they are just not what He wants from us at the moment. Hence the need for this deeper abandonment. I can think of a lot of examples of this from my life. You probably can too. The time I wanted to be a retreat leader in high school and the committee rejected me. The time I wanted to study theology to become a religion teacher but the classes left me feeling like something was missing in my life. The time I wanted to adopt but was left with a horrible pit in my stomach and just knew this wasn’t what He wanted from me at the time. We have great ideas, great desires, great potential to do great things. But none of it will work and none of it will be any good until we learn to abandon all of this and let our Shepherd carry us where He wants to go. I don’t know where your life will go, or what great mission the Lord has for you. I don’t even know what my own mission is. But I do know that He loves you, and has created you out of this great love. Your job, and mine, is to trust. Maybe it’s because the post-Christmas solitude often feels empty and uncomfortable. Instead of counting the days until Spring, I’ve decided this year to find ways to enjoy the long, dreary winter and live in the moment. I’m baking. I’m watching old movies. I’m visiting people. These are all things that you can do any time of year, of course, but somehow they seem like they belong to the winter. And of course, celebrating post-Christmas winter traditions helps too. For example, we did out first ever Epiphany house blessing where we chalked the door. 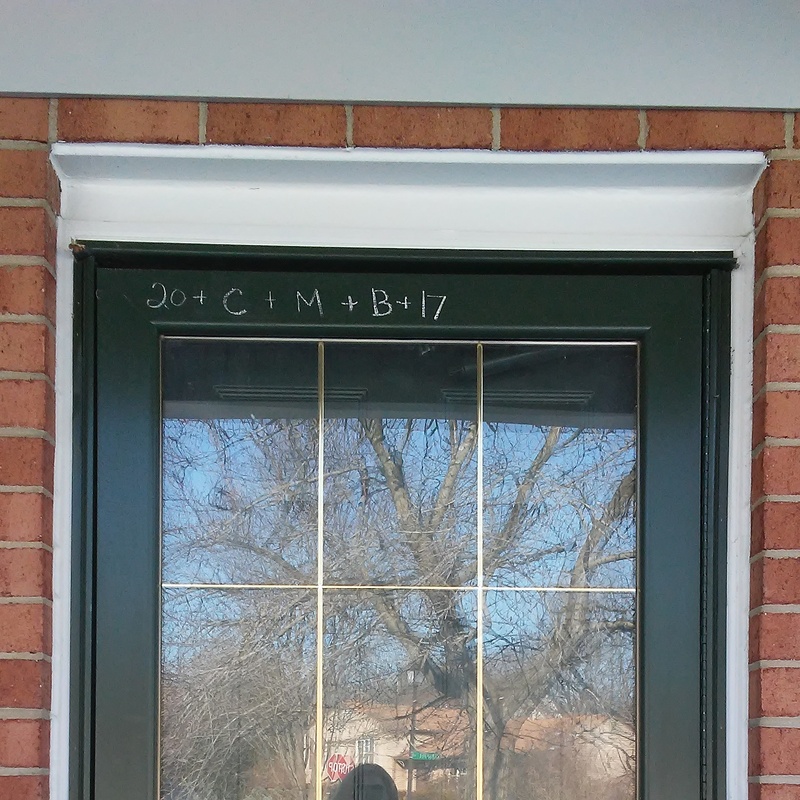 20+C+M+B+17 stands for the names of the three magi, Caspar, Melchior, and Balthazar, and it also stands for Christ Bless this House in Latin. The changes in the liturgical calendar really help to keep us centered. Ever since I started going to daily Mass, being aware of the different feast days and their associated traditions has really made my life feel more full. (Actually, if you’re interested in a really cool blog on liturgical living, check out Carrots for Michaelmas. I’m a big fan). But of course, as with most things, there’s a deeper level of this “living in the moment” thing. I’ve been trying (for the last year) to step away from all my plans and dreams, and just exist. I’ve been trying to stop thinking about what I should be or what I would like to be and just be, well, me. Specifically, I’m trying to just be God’s daughter. I was speaking in reference to my human parents, but I meant it in respect to God as well. Being able to love someone as their daughter is a unique gift. I really believe this, and I think that is also why it hurts so much for people when their human parents are unable to allow their sons and daughters to love them. And even if our earthly parents aren’t perfect, we have this opportunity to be in a love-filled relationship with our heavenly father. Jumping into his arms to hug him at the end of the day. Crawling into his lap when we’re sleepy or scared. Pouring out our hearts to him and listening as he does the same with us. Stopping by his house to say “hi” in the middle of a busy day. It’s pretty simple, really. He’s Dad. I’m Connie Ann. And this is where I am right now – trying not to worry about the future, or whether or not there is anything else that I’m supposed to do or to be. If he wants me to do something for him he’ll let me know. For now, I’m just going to sit right here and be his little girl. “Encourage each other daily, while it is still today.” -St. Paul in his letter to the Hebrews. Listening to Catholic radio on my way into work this morning, radio host Gus Lloyd reminded everyone that an important part of being a Christian is to give encouragement to others. When people are struggling, whether they’re just having a bad day or maybe dealing with serious issues, what can we do to be encouraging? How can we help, especially when we might not understand the depth of their struggle? Pope Francis recently said that sometimes there really isn’t anything you can say to make them feel better. In these cases, he said, it’s best to just be there and cry with them. Having been on the receiving end of well-wishers who maybe haven’t understood the depth of the problem being faced, I think he’s right. But here’s the thing. There is one thing that can always be said, no matter the situation. And isn’t that what the pope’s tears of solidarity are really saying, after all? I’m no expert, but I believe that is what is at the very core of being a Christian. Knowing that we are loved in spite of everything, and spreading that love to everyone, everywhere. So to everyone, no matter who you are or what you may be going through, take courage and remember that you are loved. Now let’s get out there and spread this. I look around the world right now, and as far as I can see, we are walking through a crimson field of broken hearts. My sisters and brothers are lying wounded. Death. End of a Relationship. Unemployment. Infertility. Sickness. Who am I, since I am not who I thought I was? What hope is there, what way out, since what’s done is done and there is no returning to the innocence I have lost? It’s not an easy question to answer. It’s one that I myself have struggled with for many years, and still fall prey to on occasion. After many years of turmoil and grief, my identity was lost, and the one that I had tried to form for myself was becoming twisted and more painful than ever before. It was like a broken bone that had attempted to heal but had never been properly set. There was nothing more that I could do. I was done. I was done trying to form a new identity for myself. And so, I prayed. I asked the Lord to do it for me. I asked him to take these shattered pieces of the little girl that once was, and make from them a new creation. To tell me, since my sense of self was gone, who I truly was. And once I had surrendered all my defenses, the answer came. As clear as that. Not booming out of the sky, but through the words of the priest in the confessional, and echoed again within my heart. And this, as simple as it may be, is the answer. This is the hope that we have when all is lost. That we are His. He made us, he loves us, he cries with us, and has plans for us. Nothing at all happens without his permission, and from the evil that befalls us, he brings about the good of our salvation. To all the broken hearted, to all who face this new year with anxiety and sadness, I want you to resolve to take this life one moment at a time, remembering with each step that you are the child of a God who loves you deeply. Whatever you have lost, however shattered your heart, you have a Dad in heaven who wants to pick you up and carry you, if you let him. Give him the pieces of your heart. He knows what to do with them. Let me say right now that I fully support and accept everything the Church teaches as true. If there is error in the following, please let me know. Full disclosure, I’m not a theologian, and the following article is solely my opinion. B) End up hurting people unnecessarily as a result. Notice that in all of these statements, the problem in the second half of the sentence. We get the “what” right, but our “why” needs a little refresher. Phrase #1: Women are sacred because they “bear life”. Everyone assumes all women have wombs, and they extrapolate on that. (Example, Alice von Hildebrand in her final chapter of The Privilege of Being a Woman). “All women” have the capacity to bear children, therefore we’re sacred. The problem: Women are indeed sacred—but not all of us have the capacity to bear children. In fact, not all of us even have wombs (I don’t). Not all of us are called to be physical mothers, and hinging our value on that doesn’t work. At best, it’s only hitting the surface, and ignoring the tremendous depth of what it truly means to be created female. At worst, it’s hurting tons of women who aren’t perfect and making them question their identity and sense of belonging as a daughter of the Lord. Solution: Let’s avoid the kitsch and get right to the honest truth: Women have a beautiful calling from God to love and nurture and support and encourage and help everyone around them. God calls women to all sorts of beautiful vocations that reflect this: some to be mothers, some to care for the elderly, some to teach, some to guide, but all of us are called to LOVE. Phrase #2: Marriage is like the Trinity because when husband and a wife love each other SO MUCH their love becomes a new person, a baby. We’ve all heard it before, either in CCD, Catholic school, or even an occasional homily. It’s sappy, it’s cliche, and it’s not entirely true, either. The problem: Here’s the thing: it’s true that marriage mirrors the Trinity, but this particular phraseology is ridiculous. The Father and the Son didn’t create the Spirit- the Spirit was there from all eternity. This statement sends the message that marriages to which God doesn’t grant children are somehow not complete, not successful, or worse, not even real. Furthermore, many beautiful, sacramental, fruitful marriages do not result in children (CCC 1654). Solution: Let’s re-write this: “Marriage mirrors the trinity in that the love of a husband and wife radiates new life.” Marriage is life giving, but this doesn’t always mean physically. It means that the love in the marriage generates a spirit of love that spreads outward, affecting the world around them. And that is a beautiful thing. Phrase #3: That’s a “Good Catholic Family” because they have enough children to fill up the pew. This seemingly innocent phrase is commonly uttered regarding families with 6 kids under 10 with one on the way. Or, you know, a minimum of 5. The Problem: NOBODY LIKES THIS. If you ARE a big family, you don’t want to be put on display, and you know that your life is far from perfect. You’re probably embarrassed when strangers say it. This kind of talk, which is embedded into our culture as Catholics, is not only false, but also extremely hurtful all around. Solution: Do we want to encourage the faithful living of vocations? Absolutely. Does holding up someone’s blessings as evidence of their faithfulness achieve this? NO. In fact, it borders on Osteen-esque Prosperity Gospel. Come on, people, we know how wrong this is. Think of the man born blind. Let’s talk more about the reality of life, the reality of crosses, the reality of holiness, and stop assuming things about other people, period. We know that blessings come because of God’s insane generosity, not because of our glittery awesomeness. Holiness comes from the cross. Most likely the absolute worst news of Jairus’s life. Do not trouble the teacher any longer.There’s no point. No hope. What can Jesus do now? Really, Jesus? Do not be afraid? How could he not be afraid? Many times we find ourselves on the road with Christ when we get our own earth-shaking news. Sometimes it’s the loss of a person, like it was for Jairus. Other times it’s the loss of a dream, the loss of something we’ve worked for, a diagnosis we never expected, etc. And the world tells us to abandon all hope. But that’s not what Jesus says. Do not be afraid. Have faith. October 13, 2017 will be the 100th anniversary of the famous Miracle of the Sun at Fatima. Something’s been nagging at me for a while that we should go. We were already planning on going to Spain next October, so why not add in Fatima? And regular readers know that I’m not one to discount interior feelings. I told Jesus that if we’re supposed to go, let me know and make it happen. Nothing really stuck out at me, but that little feeling of “let’s go there” has stayed with me. I never thought I’d be going on a pilgrimage—or to Portugal, no less. We love to travel, but these things were never on our list. And really, I’m not sure what it means to me. We’re not Fatima groupies or apparition junkies. We do pray the rosary most days. I would like to say daily, but I tend to skip it most Saturdays and Sundays. I’m working on that. I’ve been on quite a faith journey in the last year, and who knows where I’ll be next October. But this feels like a once-in-a-lifetime opportunity, and I’m going to take it. Maybe this trip will change my life. One of the best homilies of my life happened on a weekday morning mass at St. Matthew’s in DC. It was several months ago now, so I don’t remember all of the details, but it had such a profound effect on me that it must have been the Holy Spirit speaking through the priest that day. I don’t even remember whether the gospel reading was the Bread of Life discourse from John, or the story of the Samaritan woman at the well, or something else. What I do remember is that the priest was talking about eternal life. Here’s where my whole perspective on my daily living was changed. Pure, unnatural, overwhelming joy and a peace that surpasses all understanding. When we say that Jesus offers us eternal life, we think this refers to when we die and go to heaven. Yes, it means that, but it’s more than that. Eternal life starts NOW. Jesus says “I am the Way, the Truth, and the Life.” He is life. This gift of eternal life is the gift of Himself. And He is love, peace, and JOY. What does it mean to be joyful? Does it mean we’re always stupidly happy no matter what happens, even in the midst of tragedy? No, that’s not what joy means. There are times when we grieve, there are times of suffering and many, many tears. But this doesn’t mean we lose our joy. Joy is the peaceful assurance and hope that God loves us and reigns over all. We know in the depth of our being that we are LOVED. Joy is a fruit of the Holy Spirit. It’s a grace, a sign of His life within you. It’s the only real comfort in the midst of suffering. It comes from the faith that God loves you, rescues you, and works all things for your good. Eternal life isn’t something I have to wait for. I have it now. And I have never felt so free.